We passionately believe that in order to achieve optimal dental health your teeth need to look good, feel good, and most of all function the way they were intended to. We focus intensely on functionality with our patient’s teeth. The technology available to create your beautiful, functional smile has never been better. Utilizing “Instant Orthodontics”, we can correct many cases of missing or crooked teeth instantly. The end result is a great smile that not only looks great but functions properly. Your smile is one of your greatest attributes. It is one of the first physical traits that people notice about you in business and social situations. A warm smile says; “I am confident, happy, and approachable”. Many times a beautiful smile can serve as a launching point for life-long friendships, relationships and business ventures. Your comfort is our top priority. 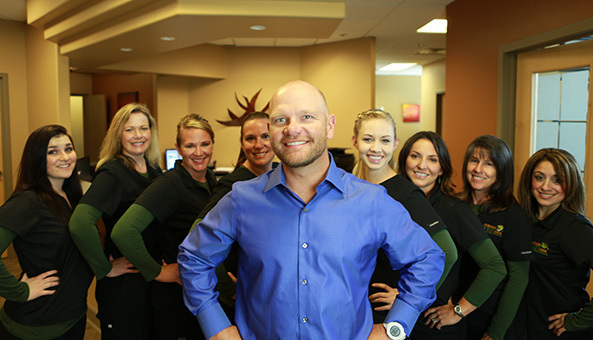 We work hard to make sure that your dental experiences with us are comfortable and even pleasurable. We listen to you and help you alleviate any anxiety or apprehension you may have about your visit. During your procedure, rest assured that you are in control and can stop the treatment at any time for a short break. We also provide a pleasant, relaxing environment to make sure your time with us is enjoyable and stress-free. We believe that you should not have to settle for anything less than a world class Smile. In some cases, your smile can be transformed in as few as three short office visits. Some of our cosmetic options include bonding, porcelain veneers, and whitening. You can also choose white onlays or white fillings if you want to get rid of your old mercury-silver fillings. We believe in catching potential problems early. Early detection means easier, less costly treatment. We use a high-tech, state-of-the-art Diagnodent laser device. This is a compact cavity-detecting laser capable of finding tooth decay much earlier than digital X-Rays or traditional visual examinations. In fact, research suggests that this painless, laser device can detect early tooth decay that a traditional examination misses as much as 76% of the time. We will always treat our patients with the highest degree of honesty & integrity. We will listen when you speak, treat you like a guest in our home, and provide you with our best professional recommendations to ensure you experience the highest levels of dental health. Your ultimate personal satisfaction is our mission, goal, and highest priority. The greatest compliment you can pay us is the referral of your family, friends, and business associates. Call us today or fill out the form to the right to schedule your cosmetic consultation.